This page is dedicated to the resources developed by faculty members of Besorah Institute. We encourage you to explore these contributions to the literature on ministry and Biblical research. Brian Craig Drurey is the Director of Discipleship at Green Valley United Methodist Church. Craig also teaches part time for Grand Canyon University and Ohio Christian University as an adjunct professor. His emphasis is in the areas of spiritual formation and discipleship, helping students to understand and engage transformation in Christ. He earned his Master of Divinity from Northwest Nazarene University. Currently, he is in the dissertation phase for a Doctor of Ministry in Wesleyan Practices from Ashland Theological Seminary. Craig serves on the board of directors and faculty for Besorah Institute. With your purchase of Relational Discipleship, a portion of the proceeds will benefit Besorah Institute. God is waiting for each of us to return home! In fact, God is already out in the world searching and inviting each person to take the journey back to God’s house. 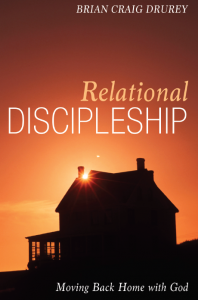 Relational Discipleship: Moving Back Home with God approaches discipleship from a fresh perspective and intentionally draws on biblical principles and examples of discipleship. In this approach, the metaphor of a house is used to describe our journey back to God. Hospitality plays a key factor in how discipleship, from this perspective, warmly calls each person forward in each step. Other modes of discipleship are solely focused on transformation of the disciple. Here, in this model, the transformation of the discipler must occur first. Then, the discipler can be a warm host helping other travelers on the path to God’s house. Join in the journey today and see how Relational Discipleship offers the call to move back home with God. Price includes shipping and handling. Offer only available through Besorah Institute. A portion of the proceeds from each purchase of this book benefits Besorah Institute.